My pal Marilyn, over at La Vie Quotienne, recently rescued this chair from her grandfather's office and gave it a makeover. 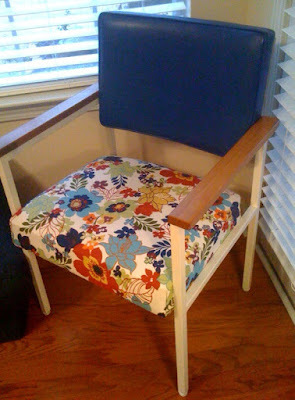 She recovered the seat and spray-painted the arms and legs "heirloom white." Imagine my surprise when she emailed me a photo and said that she was getting rid of it because of spousal taste differences, and did I want it? Also, back in January, we went to visit J's grandparents in Nashville, and took them to eat at the venerable Loveless Cafe. 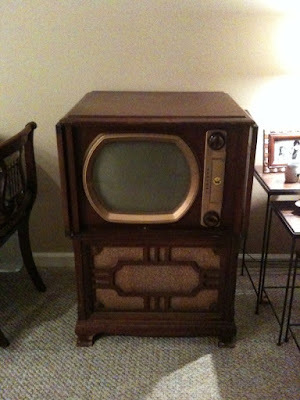 Anyway, considering J's love for antique radios (here and here, for examples), he was smitten with this antique TV idea, and scoured Craig's List when we got back to Memph. I'm not real sure where it's going to go/what we're going to do with it yet...it probably won't have a good spot until we get to move. But, it is a welcome addition to J's little antique appliances collection he's got going. I'm happy it found a home! Didn't think I'd see this on your blog. By the way, j'adore your new bedroom from previous post. Bon week-end to you too! Ok, I've seen this chair in its original home, i.e. at Marilyn's Gpa's office (this is Marilyn's sis-in-law) and I'm so impressed. I think the chair is so cute! Glad it found a home! Love the chair and the tv!